Image Attribute: The launch of JS Shōryū (しょうりゅう, Soaring Dragon / Pennant no: SS-510) at Kawasaki Heavy Industries (KHI) shipyard in Kobe on March 18, 2019,/ Source: Sankei News Screengrab. On March 18, 2019, the Japan Maritime Self Defense Force (JMSDF) commissioned its tenth diesel-electric Sōryū-class attack submarine - JS Shōryū (しょうりゅう, Soaring Dragon / Pennant no: SS-510) in Kobe. The first boat in the class entered service in 2009. The design of the submarine of this class is an evolution of the Oyashio-class submarine, from which it can most easily be distinguished by its X-shaped stern - a combination of diving planes and rudders. Japan has so far launched 11 of the possible 13 submarines in the class. The 11th submarine, JS Ōryū (おうりゅう, Phoenix Dragon / Pennant no: SS-511) was launched in October 2018. 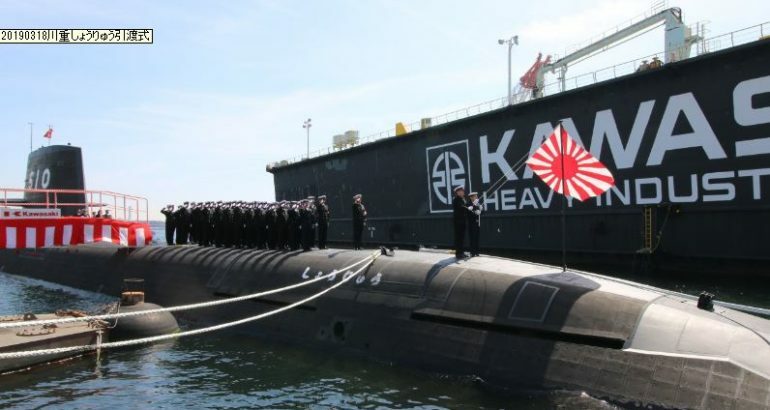 The boat is being built by Mitsubishi Heavy Industries (MHI) and is the first JMSDF submarine to be fitted with lithium-ion batteries in place of lead-acid batteries installed on the previous ten Sōryū-class submarines. 6 × HU-606 21 in (533 mm) torpedo tubes for Type 89 torpedo and Harpoon missiles.